Companies rely on consumer feedback to reflect, learn, and grow. Positive reviews offer businesses the opportunity to perfect products and services that already satisfy their consumers. On the other hand, negative feedback pinpoints areas of improvement. From delivery times to product quality to customer service, your company may need to revamp its techniques. “A negative review will not sink your business. In fact, they can even be good for business,” says Daniel Lemin, author of ManipuRATED and Senior Strategist at Convince & Convert. Respond to your consumers’ concerns. When you provide an immediate response, your customers will respect your brand. It opens a line of communication and lets customers know you care. “Trust needs to be earned, especially when it comes to interacting and developing a relationship with your customers,” says Jerry Jao, CEO and Co-Founder of Retention Science. By establishing trust, your company creates opportunities to satisfy existing customers and possibly create new ones. Sometimes, social media is the easiest way to respond. That’s why it’s important for your team to actively monitor your accounts. 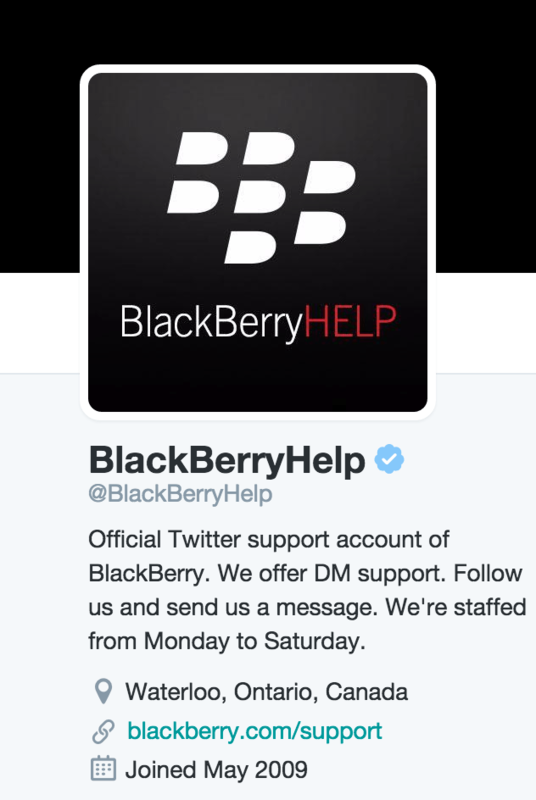 Some brands actually create Twitter accounts solely for the purpose of answering customers’ concerns. This limits negative responses on the brand’s main account. Being available to respond to a customer is only solving half of the puzzle. Be mindful of how your team responds to negative feedback. Calling the customer an idiot and demeaning their experience won’t help your brand. In the end, your company looks like a big bully on the playground. But no business really would do that, right? Wrong! When you receive negative comments, immediately respond to your customers. But don’t become an aggressor. Brands that show respect always come out on top. Consumer feedback matters. Negative feedback usually happens when a customer is unhappy with a particular product or a specific customer service experience. Little Caesar’s once dominated the pizza industry and outperformed their competitors, Papa John’s and Pizza Hut. But over the years, the company saw a decline in sales. 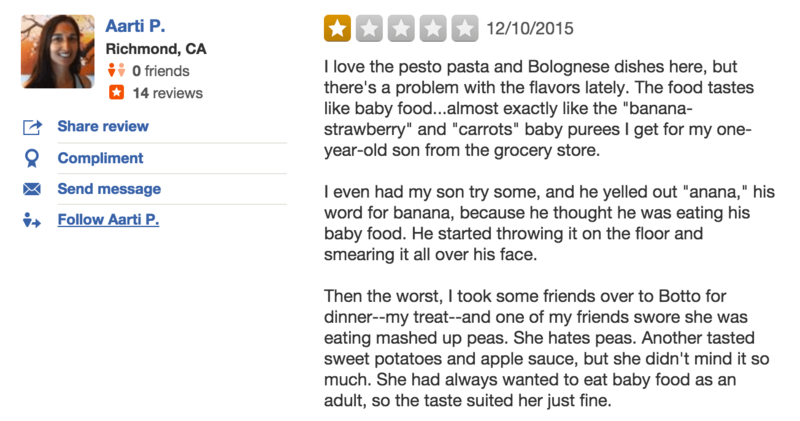 Customers complained about the ingredient selection, price, and overall customer service. And the company admitted to tweaking the ingredients to cut costs, causing the quality of the product to suffer. Using that negative consumer feedback, the chain bounced back. The pizza chain started making more quality pizzas at an affordable price. It also made it easier for customers to rate the experience. So, instead of protesting your customers’ legitimate concerns, do something about it. In another example, a customer complained about the “super low quality” of the on hold music of an Apple call center. In response, Apple’s CEO Tim Cook personally read and responded to the customer’s complaint. Whether good or bad, honest feedback is always a plus. It’s better to know your mistakes so that you can actually take action and correct them. So, avoid taking the criticism as a personal attack on your brand. And just make the necessary changes to do better next time. Take advantage of negative feedback by turning it into a solution. Hearing unflattering comments about your brand may be difficult. But in the long run, it will make your business run smoother. Instead of shying away from criticism, solicit more feedback from your consumers. Use negative feedback to create a brain trust. It’s a proactive approach to simply waiting for something to go wrong. “…[F]ind existing or potential customers to engage with as an ongoing focus group or advisory committee,” says Amanda Steinberg, CEO and founder of DailyWorth. Most customers won’t even report problems. They just stop using your product or complain about the experience to their friends. If your team is up for a challenge, designate a live chat for feedback only. This way, customers are offering suggestions before problems even arise. The goal is to follow up after every suggestion. Moreover, it circumvents bad reviews posted on Yelp. Rather than leaving a negative response, consumers may want to contact you first to get the problem solved. It also creates an atmosphere to build better customer relationships. On public forums, people are upset and want to vent. Providing that one-on-one conversation, let’s people drill down to the real complaint. 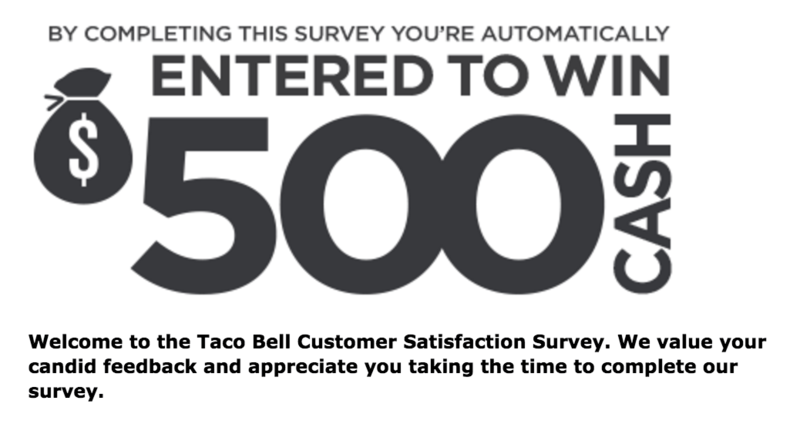 To entice more customer feedback, offer a reward. A small gift works well. Try a gift card or a 15% discount on their next purchase. An incentive will boost response rates. Make honest feedback possible with anonymity. Not all customers want their name attached to negative reviews, so give people the option to be anonymous. Negative reviews are inevitable. Not everyone will enjoy your product. So, be proactive. Ask for feedback upfront to solve the problem faster. The customer is the most valuable resource in your company. No wonder successful businesses make it a priority to give their customers the best service possible. “We’re not competitor obsessed, we’re customer obsessed. We start with what the customer needs and we work backwards,” Jeff Bezos, CEO of Amazon. You can’t solve every problem. However, your team can be an active listener. Learn to talk with customers frequently. Engagement gives an inside look at the customer’s concerns. So, it’s safe to say that customer support is necessary to keep your doors open for business. Nike implements this strategy well. The brand actively listens to customer concerns and responds in a timely manner. 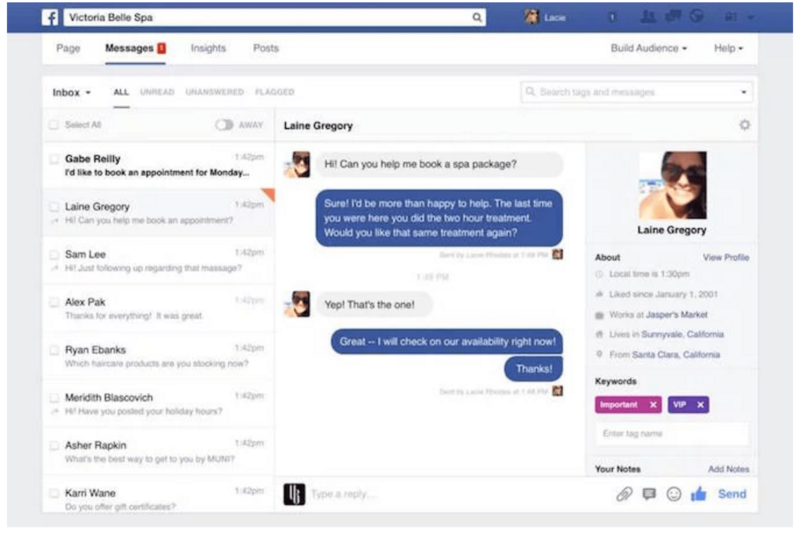 Recently, Facebook rolled out new features to help customers contact businesses through their pages. Business owners can now keep track of their interactions with consumers. Make customer service an integral part of your brand. To contribute to the customer’s satisfaction, every position should require training in how to best serve the consumer. Educate everyone in your business, from the managerial staff to the executive team, on the importance of customer service. The key is not to just identify these potential problems, but instead to work to solve such issues so that they do not ruin your brand. Research proves that “it is 6-7 times more expensive to gain a new customer than it is to keep an existing one.” Therefore, it’s better to appease angry customers rather than spend money to gain another. Consumers want to trust their favorite brands. And negative reviews often break that bond. Harvest the relationships that you have already fostered. Continue to provide excellent customer service. The dedication shown to your existing customers will ultimately lead to more business. Moreover, these customers will continue to stay loyal if you offer exceptional customer service. Create a customer loyalty program to show your appreciation. 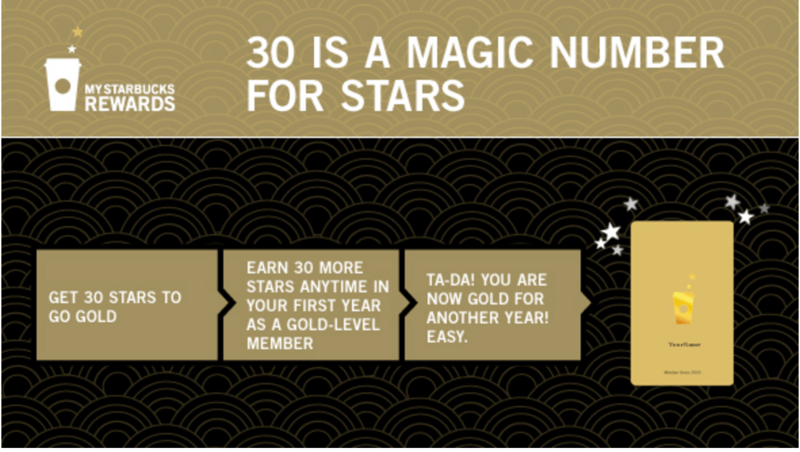 For example, Starbuck’s a rewards program gives its loyal consumers free beverages, free birthday treats, and even a personalized gold Starbucks Card. Loyalty programs close the loop on negative reviews. It’s an opportunity to display the changes you’ve made. “This step is critical, because customers will be encouraged to give input if they know they are being heard and know they may be driving change,” states Whitney Wood, managing partner of the Phelon Group. Don’t discount existing customers. They are the lifeblood of your organization. Remember: companies that cater to repeat business receive better a better return on investment. Technology is always changing. More importantly, consumer tastes and preferences evolve with the times. People aren’t listening to Taylor Swift’s new album on a cassette or watching movies on VHS. Trends and pop culture alter people’s perceptions, which in turn affects your product or how you deliver a service. Needless to say, eCommerce businesses that want to thrive must pay attention to shifting consumer tastes. Negative consumer feedback is one way to evaluate the pulse of upcoming trends. Different customer preferences will involve different ways to serve your audience. To stay ahead of your competitors, co-create products with your consumers. Get them involved in the product development stages. This way, the end product is something they want and not what your company assumes consumers desire. Try localizing your services based on a particular neighborhood. Tailor your inventory, marketing, and delivery methods to fit the community’s needs. In 2016, expect apps to streamline the mashup of eCommerce and social. Instagram has the “Shop Now” feature, followed by Pinterest’s “Buyable Pins.” Find ways for your business to integrate its products into this blend of social commerce. A Corvisa survey found that “77 percent of consumers are open to getting text messages from companies.” How can your business send customers appointment reminders? Are you willing to send push notifications about sales and discounts? Opportunities exist to be more customer-centric. Accept the negative feedback. Take it as a sign that times are changing. Be ahead of the curve and learn how your business can prepare for the future. Surviving negative consumer feedback isn’t easy. Instead of fearing the worse, train your team to learn from the constructive criticism. Rebound from the situation. Respond to customers in a timely fashion. Make improvements to your products. And reassure customers that you exist to serve their needs. Recognize your mistakes; then, move your company forward. JetBlue AND Nike killing it on Twitter. 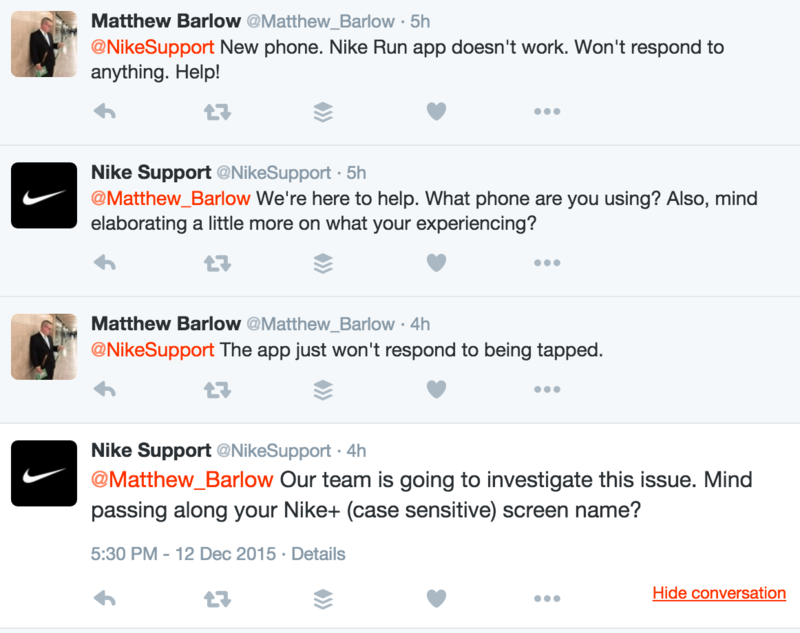 Twitter is fantastic for customer service, our choice. But as a consumer, I can’t stand it when a brand/company sends me a DM, but I can’t respond because they’re not following me.